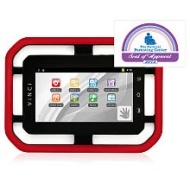 alaTest ha raccolto ed analizzato 11 recensioni su VINCI Rullingnet VS-3001 8 GB Tablet - 7" - ARM Cortex A8 1.20 GHz. La media della valutazione per questo prodotto è 1.6/5, confrontata con la media della valutazione di 4.7/5 per altri prodotti. Abbiamo analizzato differenti valutazioni di esperti ed utenti, età del prodotto ed altri elementi. A confronto con altri prodotti, VINCI Rullingnet VS-3001 8 GB Tablet - 7" - ARM Cortex A8 1.20 GHz ha ottenuto un alaScore™ complessivo di 71/100 = qualità Buono. I would not recommend this product to anyone. It has to be turned on to charge and still doesn't charge right. DOES NOT come with the curriculm that is advertised for this specific tablet. Very unhappy costumer. Very unhappy parent and child! Do not buy this product we have had it foronly 3 days and it freezes up and wont operate till it dies, also the battery dies within hours even when it is not being used! Your better off buying a ipod touch for the price and getting kids app on that!